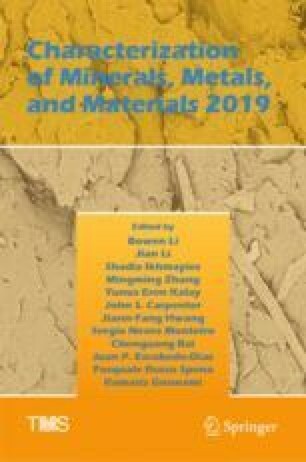 Sinter samples produced from pot-grate sintering tests were evaluated and analyzed by optical microscopy, X-ray diffraction (XRD) and inductively coupled plasma optical emission spectrometry (ICP-OES) to study the effects of metallic iron sinter feed on sinter mineralogy and quality. Major mineral phases presented in the sinter samples are hematite and magnetite; minor mineral is wustite, silicate, and silicoferrite of calcium and aluminum (SFCA). XRD peaks of metal iron are weak in all sinter samples, and most metallic iron observed in sinter samples is reduced iron from wustite. The sinter produced with higher metallic iron feed has comparable Tumbler index (TI) and higher low-temperature degradation index (LTD). The higher LTD of sinter produced with higher metallic iron feed is due to the fact that lower part of sinter bed was melted at a higher temperature and cooled more slowly in the sintering process compared to that of lower metallic iron feed sintering process. The authors would like to thank ArcelorMittal Global R&D management for their permission to publish this work.